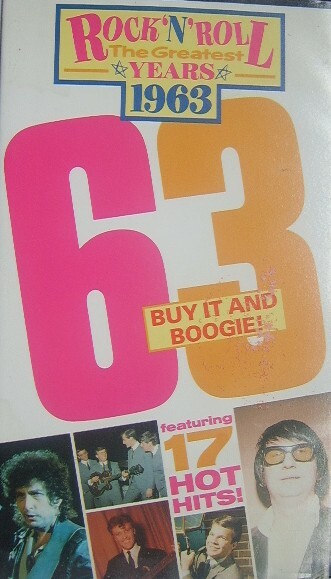 This is a great rare VHS pal video titled "Rock'n'Roll The Greatest Years 1963".It contains Some acts are in colour and some are in black and white and the video plays for approx.45 minutes. 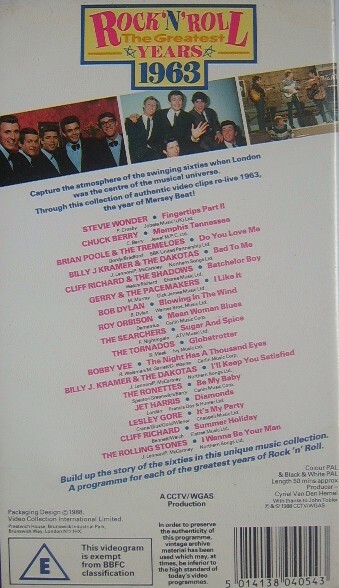 acts include:Stevie Wonder..Fingertips, Chuck Berry..Menphis Tennessee, Brian Poole ..Do you love me, Billy J Kramer..Bad to me, Cliff Richards..Batchelor Boy, Gerry and the pacemakers.I like it, Bob Dylan..Blowing in the wind, Roy Orbison..Mean woman blues, The Searchers..Sugar and spice, Tornadoes.Globetrotter. Bobby Vee..The night, Billy J Kramer..I'll Keep you satisfied, The Ronettes..Be my Baby, Jet Harris..Diamonds, Lesley Gore..I'ts my party, Cliff Richards..Summer Holiday, Rolling Stones..I wanna be your man.